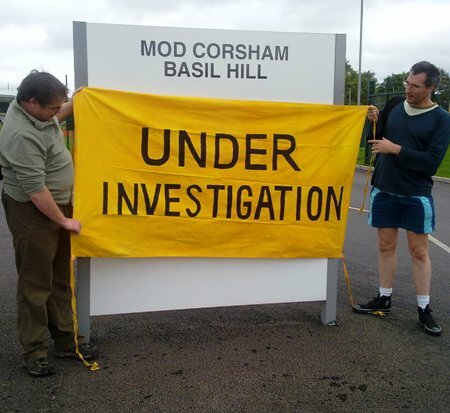 Protesters against remotely contolled killing and assassination visited MoD Corsham on Tuesday 4th October 2011 before heading to Paradigm – the UK’s main supplier of UAV bandwidth to the UK and the U.S.
Outside Paradigm’s Main Operations Centre at Hawthorn, built over the existing Brown’s Quarry, part of the ‘Burlington Bunker’ underground complex which is still in use, Ministry of Defence Police closed and guarded Paradigm’s inner gates while banners were held up. Paradigm refused demonstrators entry to their inner compound. It seems they weren’t too pleased with the attention being brought to their activities. 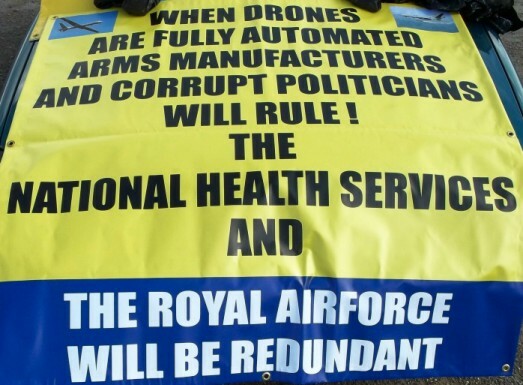 Paradigm, under a PFI agreement are responsible for all aspects of the UK’s Skynet 4 & 5 satellites. They are keen to promote their glossy presentations describing how they provide a service to UK military personel but it seems they aren’t so keen to discuss their provision of critical bandwidth services to the US military facilitating extra judicial murder and assassinations. Under UK Memorandums of Understanding with the Yanks, Paradigm has developed the UK’s Skynet 5 A & B satellites to be interoperable with US systems…….but as permitted by its PFI agreement with the UK it operates Skynet 5C commercially, and sells commercial bandwidth space to whoever it likes. It has recently done various deals with companies such as Caprock and Intelsat to supply additional Ku and other bandwidth to the US for UAV operation. 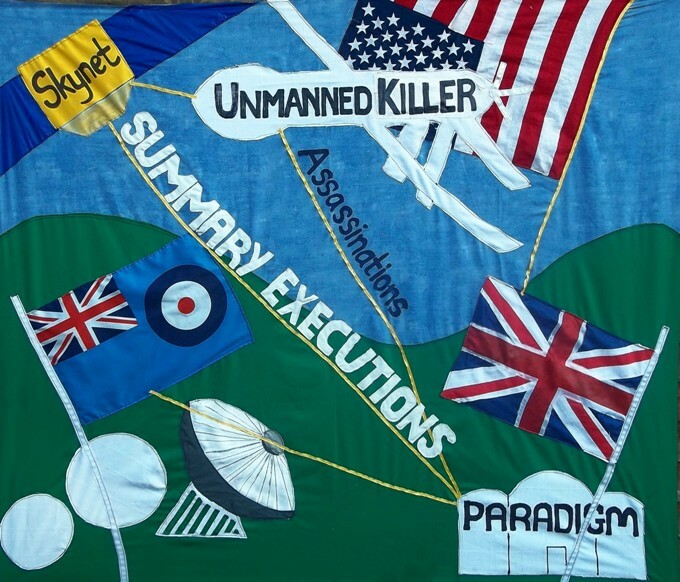 The plain fact is that Paradigm is complicit in the extra-judicial murders the U.S is carrying out in Pakistan, and aiding and abetting it’s rapidly expanding UAV activity in countries from Yemen and Sudan to Afghanistan and Libya. 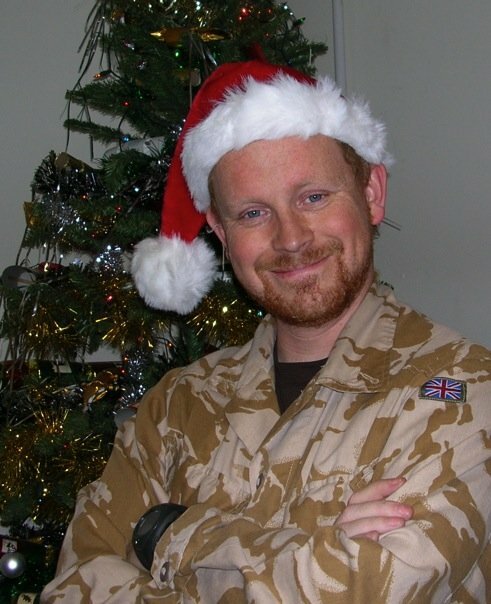 Lt.Cdr Andy Baverstock of the Royal Navy......."What do you want for Christmas this year children ........ a hellfire missile or a paveway bomb?" During the program you can hear Lt. Cdr Andy Baverstock of the Royal Navy, previously part of a 3 man UAV remote control team describe how he can tell by the way people walk whether they are people moving ‘tactically’ and thus deserving being put to death on the spot by a UAV pilot thousands of miles away….or if they are farm workers. ” the guys move differently. You can tell whether people are moving tactically or whether its a group of guys going to irrigate a field”. It can only be hoped that those planning to stay alive under the predatory eyes of the likes of Andy Baverstock are careful about the way they walk. It’s a startling state of affairs when someone in Creech AFB Nevada, or soon to be RAF Waddington can sit at a desk ordering the execution of human beings and then an hour or so later being playing about in a swimming pool or lunching on a balcony at a Las Vegas restaurant with ‘views to die for’. 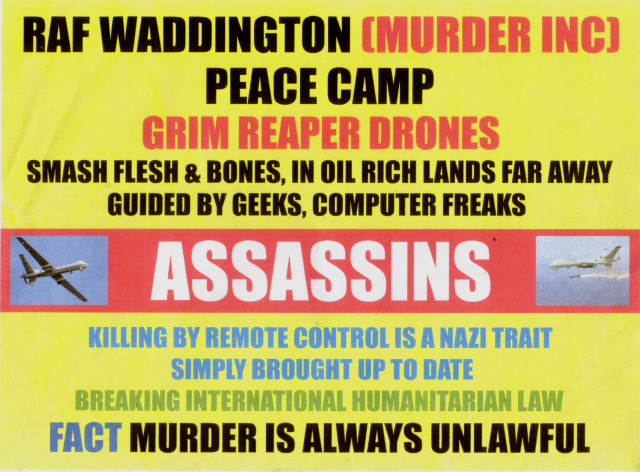 Paradigm, from their outwardly insignificant suite of offices in rural Wiltshire with their grubby sign, are providing the full end to end services required for these killings to be made possible. 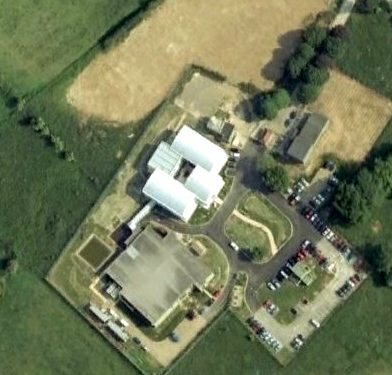 It has two Satellite Ground Control stations, at RAF Oakhanger in Hampshire and RAF Colerne in Wiltshire, with Oakhanger providing telemetry and services for the US, with work contracted out to SERCO. L3 communications, which provides drones with command and control equipment has also installed compatible equipment at Oakhanger. In addition to having rights of access to UK MoD satellite equipment the U.S government is renting additional bandwith on Skynet from Paradigm. 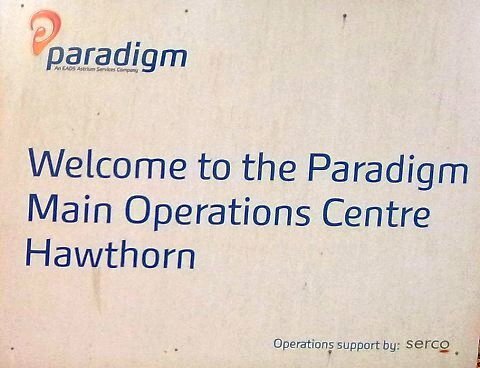 Paradigm’s offices have been built over the former CDCN (Controller Defence Communications Network) underground bunker at Brown’s Quarry, Rudloe Manor, Corsham. The original surface lift shaft for personel to the underground complex remains with various original buildings and airshafts. 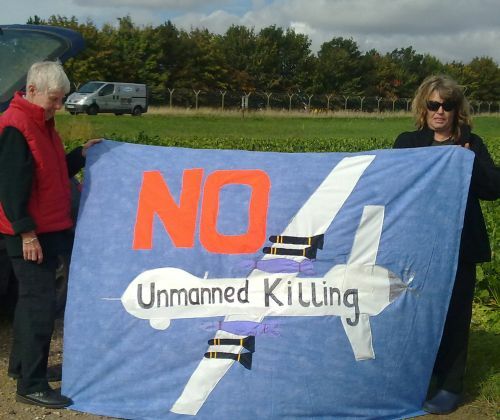 Helen John has been protesting the UK’s use of drones at RAF Waddington since 3rd September 2011 and is looking for support at Waddington. 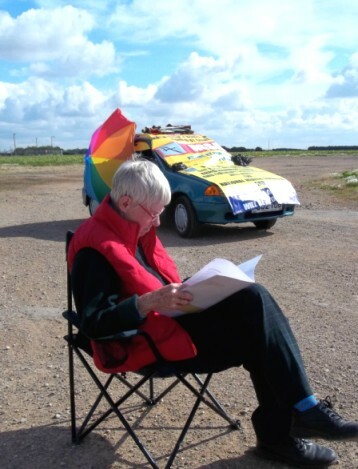 Helen John at RAF Waddington, protesting about drones….